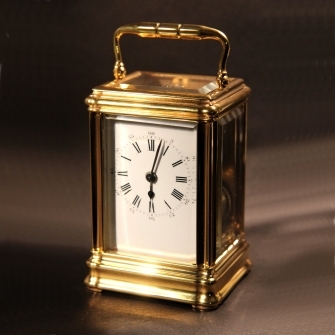 M. C. Taylor - Drocourt, small striking French Carriage clock in a gorge case. Circa 1870. 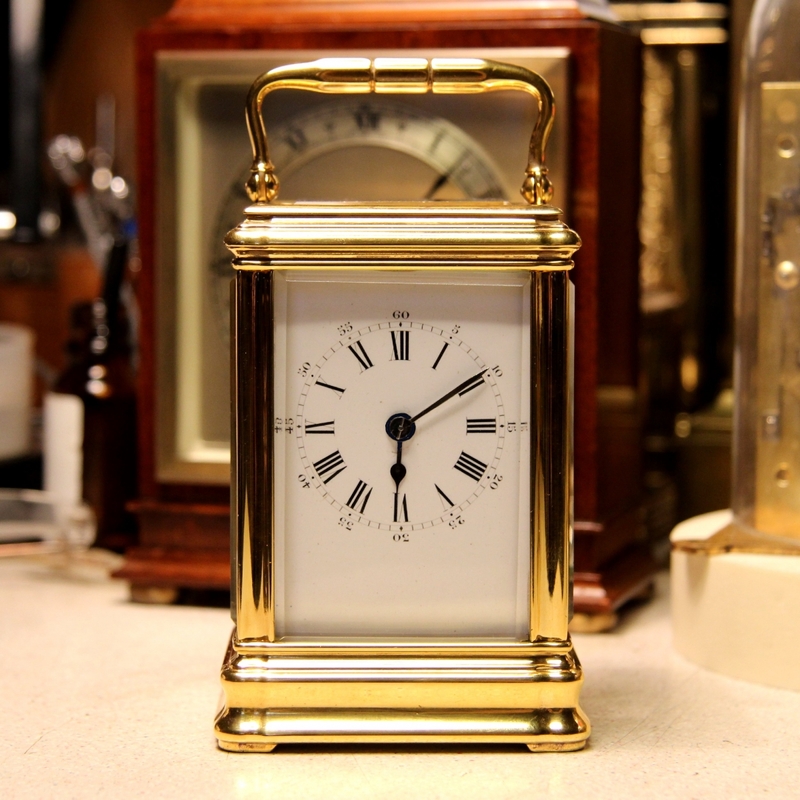 An unusually small but delightful clock by this eminent French maker. 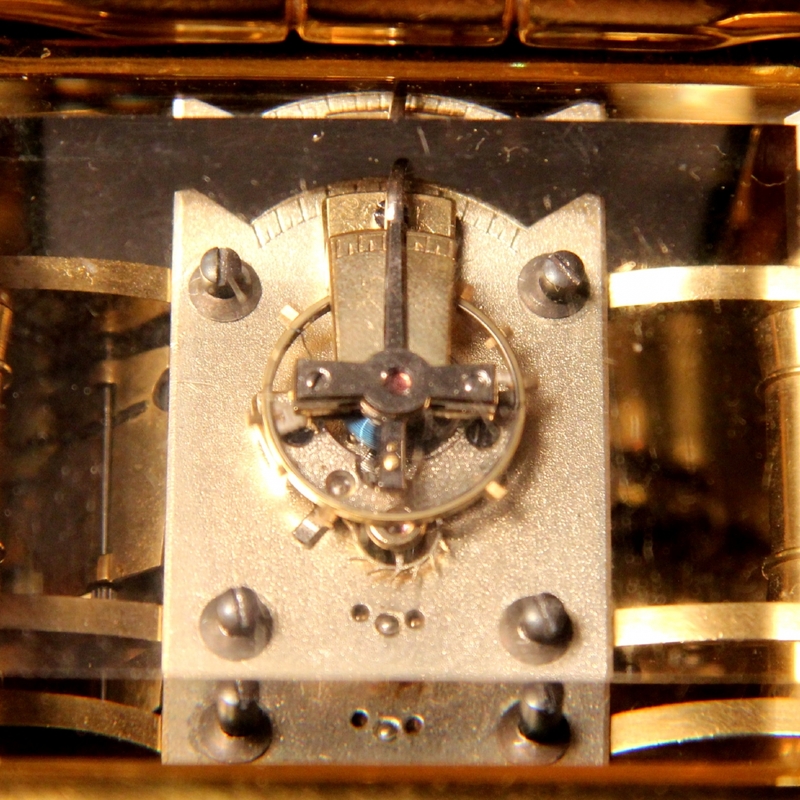 The eight day duration two train movement with its original, fully jewelled, ratchet toothed, side lever platform escapement. Also having stopwork to the going train and rack striking the hours and halfs on a surprisingly loud coiled gong. The backplate bears the standard logo of a carriage clock flanked by the letters "DC" used by Pierre and Alfred Drocourt. It also bears the serial number of 20947. Behind a 2" wide x 2 3/4" high white enamel dial with black Roman numerals within the minute ring and 5 minute Arabic numerals outside it. Contained in a well proportioned 'Gorge' gilded brass case with 5 bevelled glass panels, the top of which being full-size and rectangular. The top carrying handle is cast and bracketed with a one direction swing. The movement serial number is also present on every case part. The clock also has a velvet-lined, leather clad burgundy box with removable viewing panel. 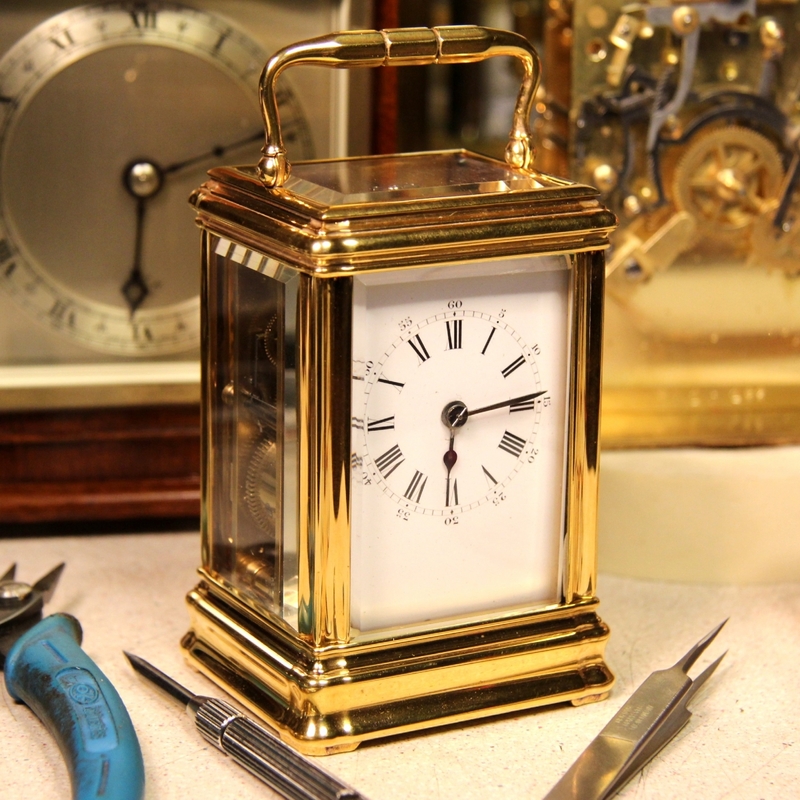 * This is a little treasure of a clock by a very good clockmaking company of father and son. Alfred took over from his father, Pierre about 1880. All clocks known by them are considered to be of superb quality and attractive in appearance. Their premises were at Rue Debelleyme 28, Paris. Rue de Limoges, Paris and also at Saint-Nicholas-d'Aliermont. The value and rarity of this item is greatly enhanced by its very small size which can be judged in the second picture showing tools and a pair of tweezers. Dimensions: 4" high (excluding handle x 2 3/4" wide x 2 1/2" deep. Investment forecast: 4 (it is expected to increase in value by 40% over the next ten years).